The Jordanian newspaper al-Dustur [Constitution] reports that Daesh (ISIS or ISIL) has captured the al-Anbar city of al-Baghdadi in western al-Anbar Province. Twenty-five Daesh commandos, some of them with suicide bomb belts, then threw themselves at the outskirts of the al-Ain military base about 9 miles away, where 300 US troops are stationed. That attack was beaten off, but there were fears for the safety of the big US contingent of trainers and special forces personnel at the base. A US General Kirby maintained that the Daesh advance was not significant and that it is rare it gains a new town. 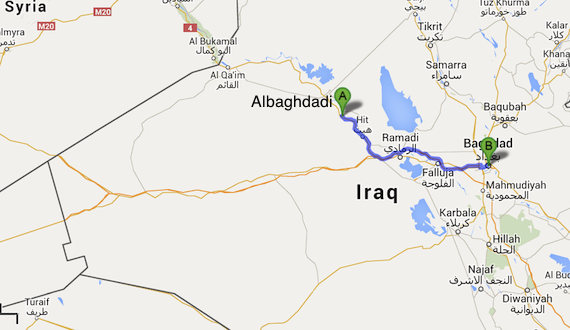 But in fact, Daesh has been expanding its territory in western Iraq, even in the face of US bombing raids. The major Iraqi town it has lost in al-Anbar Province is Jurf al-Sakhr in the far south of the province near the capital. That the Daesh extremists could take a town so near an Iraqi base, not so far from the capital, raises questions yet again about the competency of the Iraqi army. The Iraqi government rejected the idea of foreign infantry troops being stationed in al-Anbar, and tried to shoot down allegations that the Shiite-dominated government in Baghdad was not very interested in the fate of strongly Sunni al-Anbar.